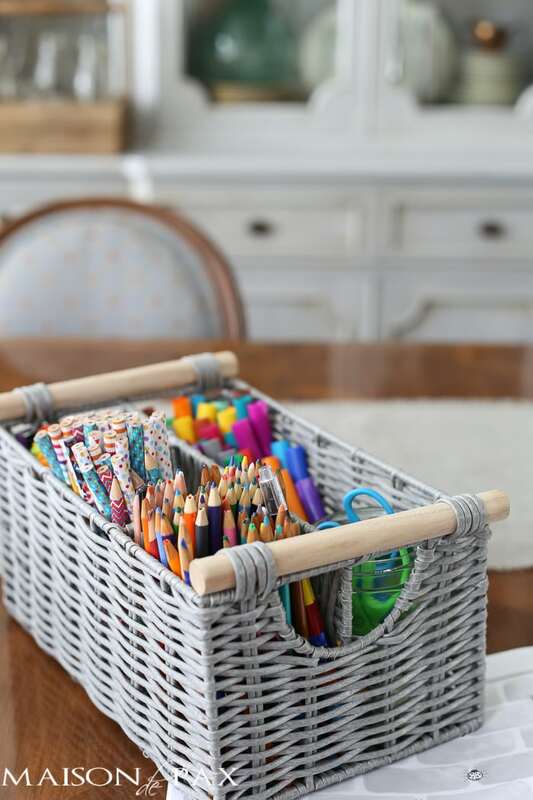 Organizational tips for creating a homework space or schoolroom in the dining room or any space in the house. My kids have recently fallen in love with Mary Poppins’ music, and this former musical-theatre choreographer is loving it. We have been dancing to “Step in Time” all over the house and singing “Let’s go fly a kite” until we’re hoarse. Talk about old school, quality entertainment. 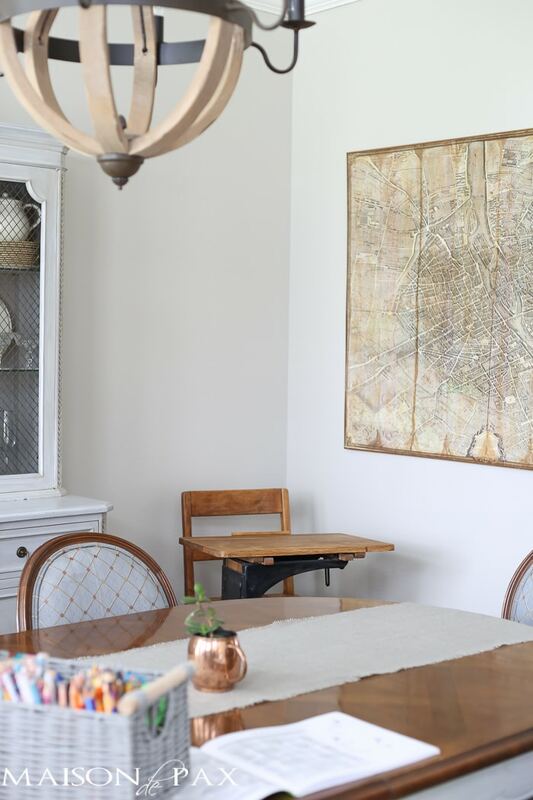 If you follow me on Instagram, you may have seen my post the other day that I spent some serious time reorganizing the dining room, which doubles as our schoolroom. 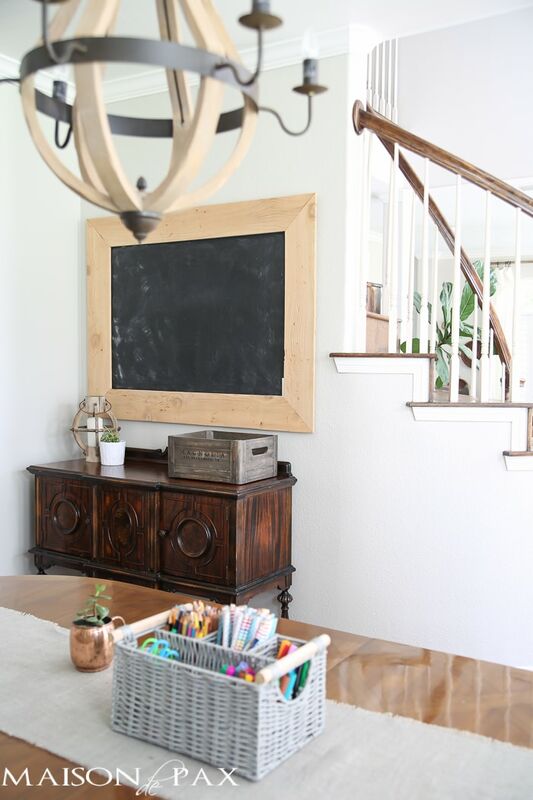 And the result – an organized schoolroom ready for the fall to come – was totally worth it, and it seemed like the perfect thing to share with you today for the Back to School Style Guide hosted by sweet Amber from Restless Arrow. Before I continue, let me say that my oldest attends a university model school, which is just a fancy way of saying he goes to school two days each week and we homeschool the other three. So I need a space that is first-grader friendly and can keep a 4 and 2 year old occupied. Plus, we’ll be doing pre-K type work with my 4-year-old in here, too. 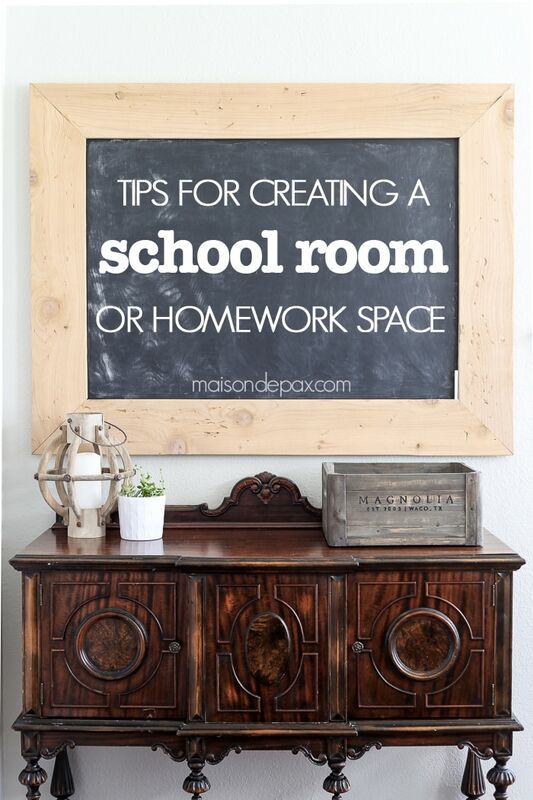 But even if your kids attend full-time school, having an organized space for homework can be so helpful. 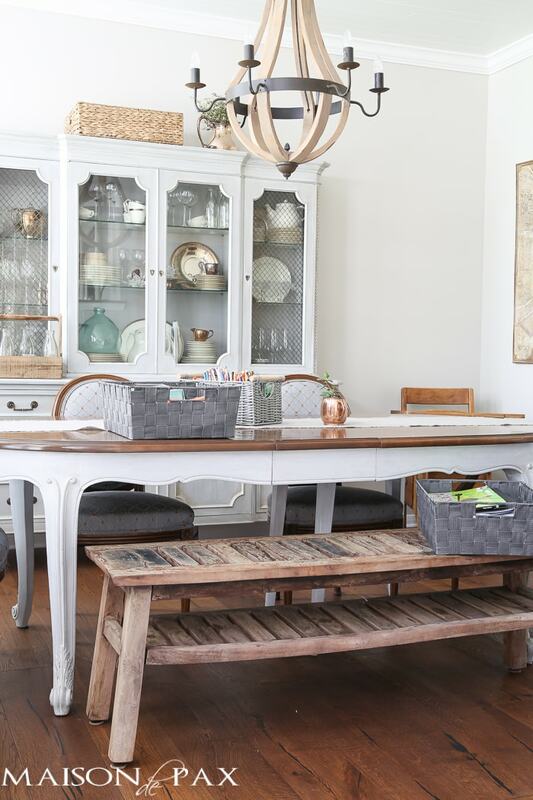 We could have devoted a portion of the guest room or some other space upstairs to the schoolroom (which may yet happen as the kids get older and more independent in their studies), but for now, I can’t imagine a more logical space than the dining room. It’s right by the kitchen so I can keep up with housework, the dining table works perfectly for spreading out big projects, and the light we get in there is lovely. BUT… it’s right by our front door and we actually like to eat in there sometimes, so organization is key (not to mention I’ve got some OCD going on, I admit). Whatever room you use, this is so helpful. Not only does this keep them corralled, but it allows the kids to take more ownership of them. They can take them out and get ready to work, and they can also carry them outside or upstairs or to the kitchen we we have mobile schoolwork days. Plus, my 4 year old is not so great at keeping books properly aligned upright on a shelf, but he can put them in a basket. Trust me when I say that if I can find space in my china cabinet for art supplies, you probably can, too. I have three different sets of china and countless napkins and props for photoshoots, but these shelves are reserved for coloring books and busy bags. And if you look down to the right, you’ll see where we store our poster board, too. I found this little thing at HomeGoods for $9.99. The pre-divided sections are perfect for supplies! 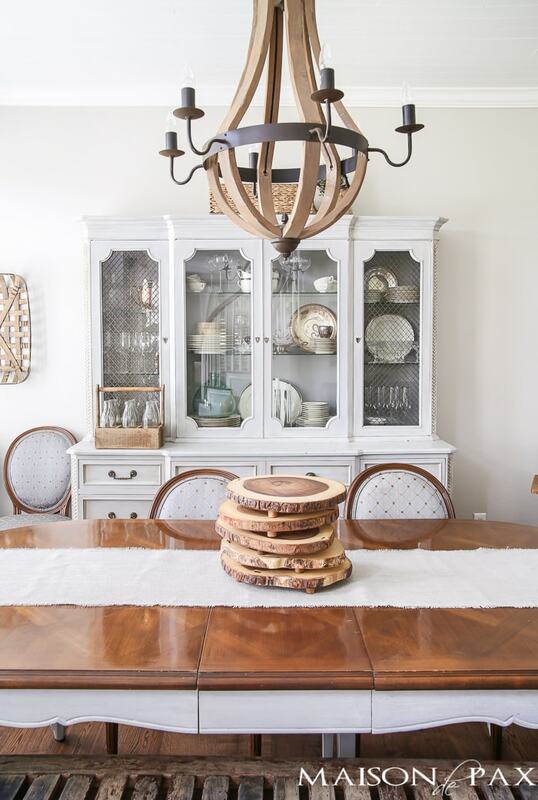 See that pretty basket on top of my china cabinet? It’s full of paint, sharp scissors, and other art supplies that I do NOT want within reach of my toddler. It keeps it all in the same space but allows mom the control over those things. This little $5 thrift store table I painted has been the perfect spot to entertain the 2-year-old (and even the 4-year-old sometimes). We keep her alphabet puzzle and a bucket of crayons here all the time. Since she can reach the coloring books, she is set if she wants to “work” alongside her brothers. Honestly, I fought this for a while. We have so many windows downstairs (and I’m not complaining!) that we don’t have much wall space for art. These walls in the dining room are seriously almost my only ones in all our living spaces… So I wanted to display other things. But I found myself last year dragging in our IKEA easel chalkboard on a fairly regular basis… So I finally conceded defeated and built this one. I’m working on a full tutorial for it (it was easy and cheap! 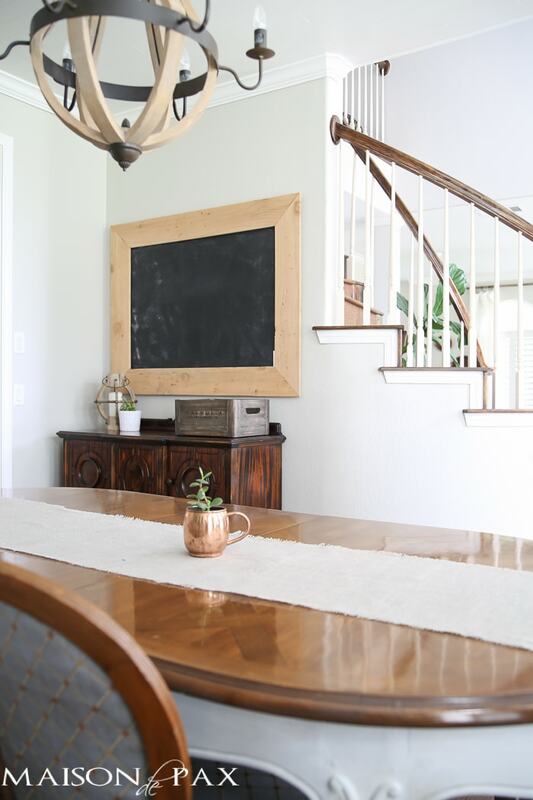 ), but for now we’ll just say that I love the vintage school room vibe it gives without feeling awkward in the dining room. While the dining room table is a great place to work (and it may be your only option space-wise, I realize), I love having a separate space for my son to work. It allows him to focus (and keeps his sister from trying to color on his page or steal his pencil). This little vintage desk that I restored has been perfect for that. I can honestly say that it doesn’t ever get too bad. If there is a place for everything, it doesn’t take long to put it all back. We still manage to eat dinner in here at least once a week, and I’m usually not embarrassed when people come to my door uninvited. 😉 I’d say that’s a win. For more fun back to school style ideas, go visit my sweet friend Emily at Eleven Gables. This woman survives 4 boys in style and grace; I’m sure she has got some excellent back to school ideas for you today! this is great! 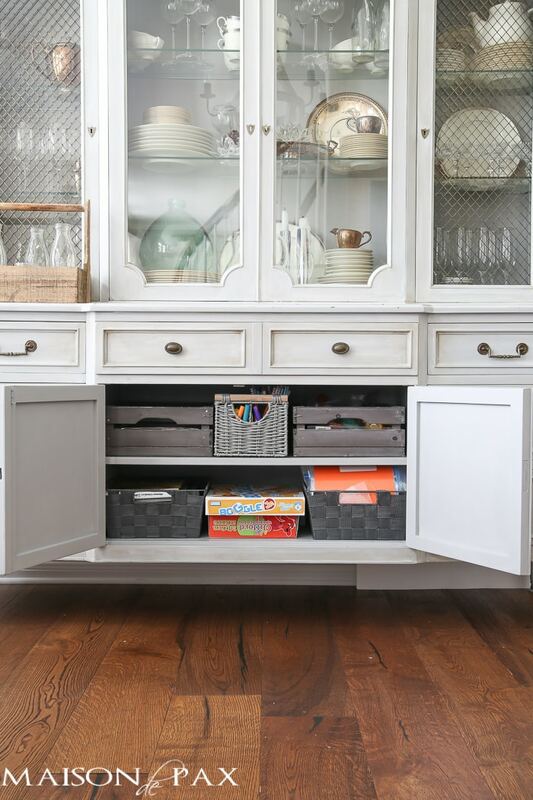 we do so much of our homework in our dining area as well, and i love keeping things hidden in pretty storage pieces! Great tips, Rachel! I think I need to find a silverware holder for art supplies. That’s a good one! Our dining room seems to be our sprawl-out-and-create room too. Rachel!! This is GORGEOUS! 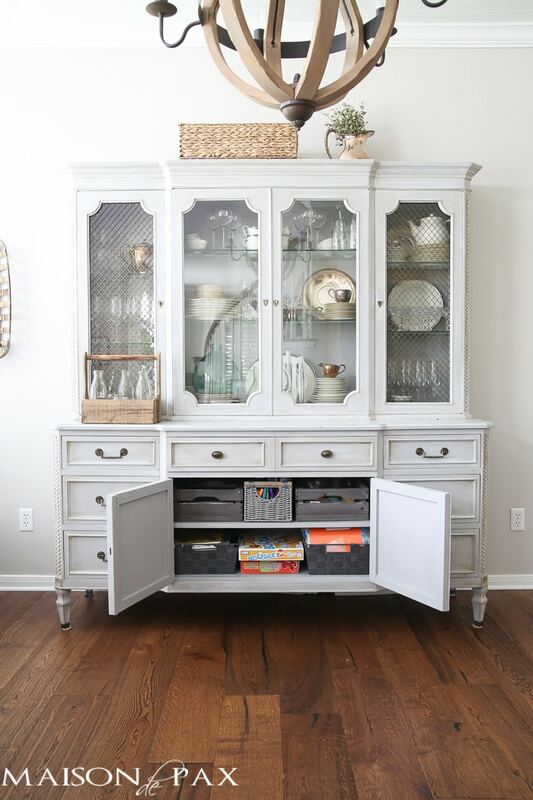 Your storage ideas are just perfect AND I have heard so many good things about the university style model! Thanks so much for joining in with us! 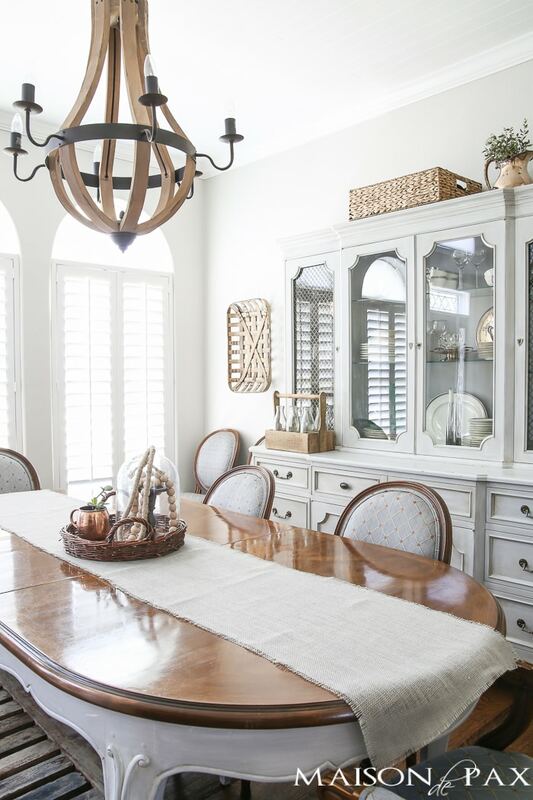 We turned what could have been a formal dining room into a library, and we do school at what we call the kitchen table–though technically it’s not in the kitchen (we don’t have an eat-in kitchen) and we should call it the dining room! We have school at that table–the one where we eat all of our meals. We don’t keep our supplies or books in the same room (it’s a great room, and there isn’t a place for them there) but since all of the main rooms are open to one another, the supplies and books aren’t far. That said, I love your plan, and if I had room for a sideboard in my dining area, I would definitely move our things to there! 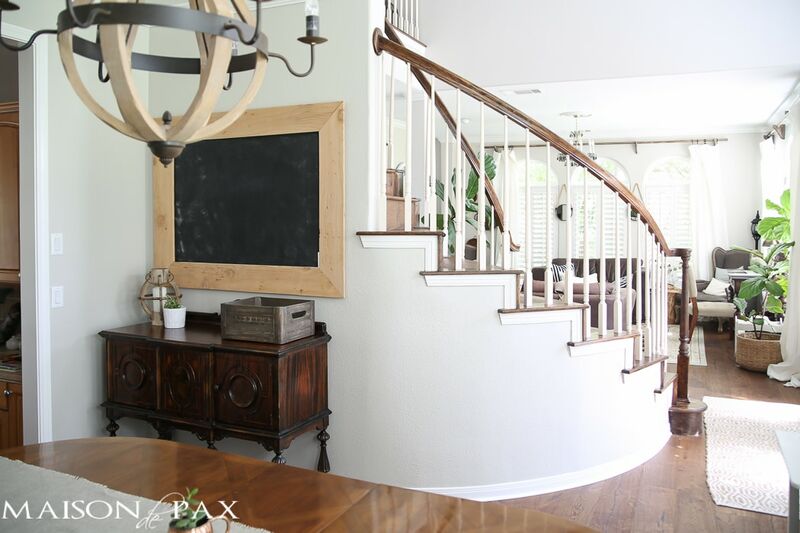 I’ll be featuring both my library and our dining area (aka school area) on my site soon. I have one main wall in the dining area, and I’m changing out the photos on there this week. 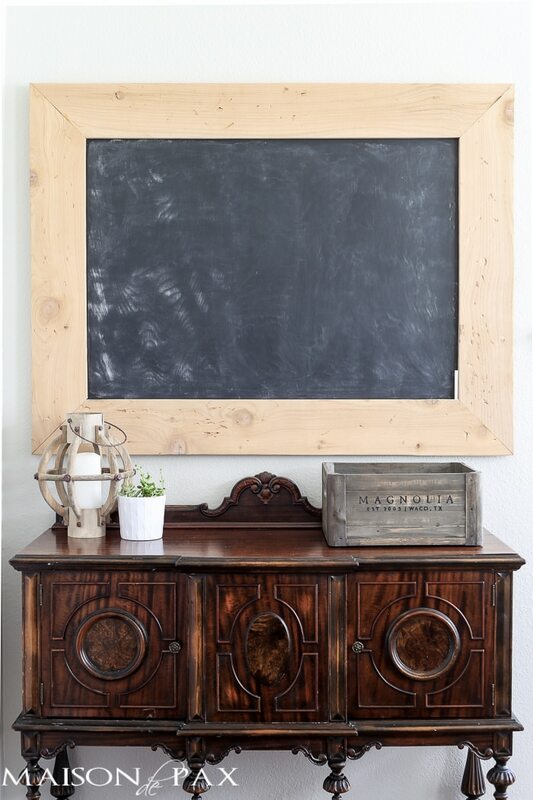 i love the chalkboard and i would love to make one for a large wall we have! can’t wait to see the tutorial! 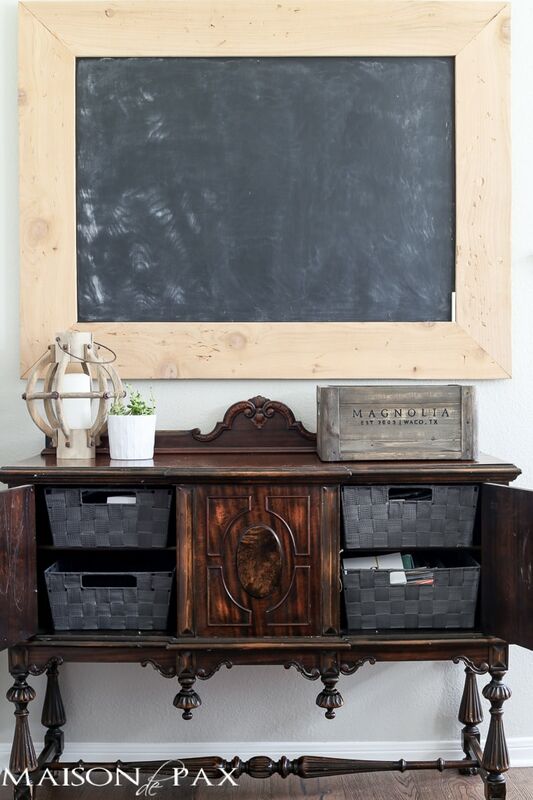 Great tips and gorgeous storage ideas, Rachel!! This is perfection! 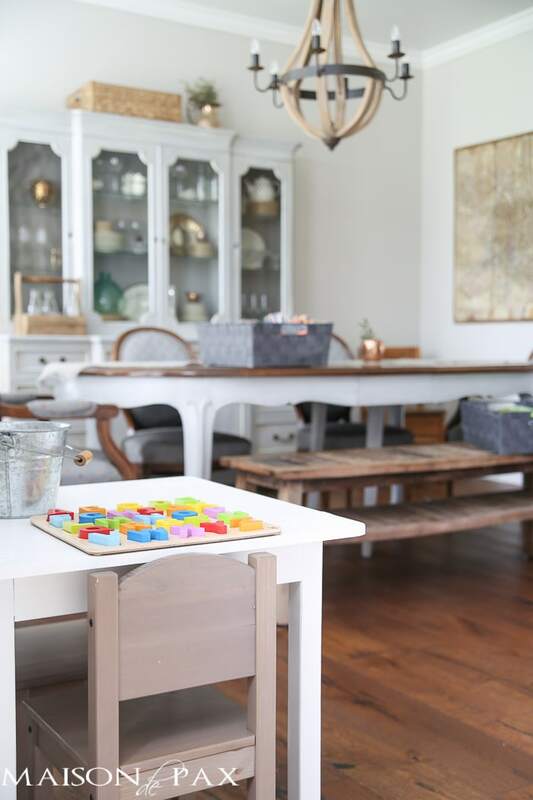 I love that you have found a way to meet your children’s needs and still keep the house pretty. Such a challenge some times! haha! Our last house was so tiny and I ended up using the pantry for the school room supplies (to use at the kitchen table). When the door was open all the charts and ABCs were taped inside for us to see during class time. Those are sweet memories for us.